27. 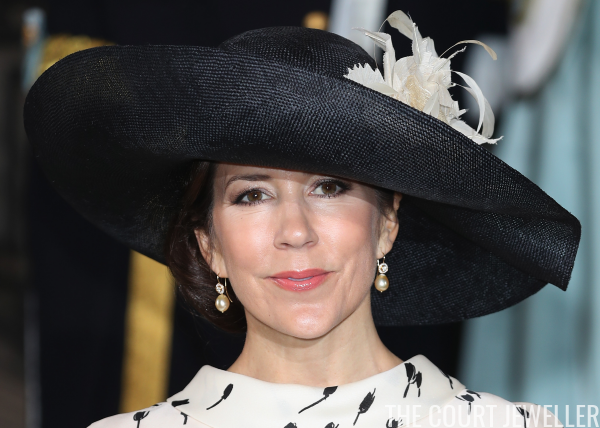 Lynggaard Lotus Earrings: Mary wore the Lotus earrings by Ole Lynggaard Copenhagen (set with white moonstone, citrine, grey moonstone and rutile quartz drops) for a reception celebrating the 70th birthday of King Carl XVI Gustaf of Sweden in April 2016. 26. Diamond Floral Stud Earrings: These classic diamond floral stud earrings were Mary's choice for an April 2014 visit to the Soenderbro School in Copenhagen. 25. 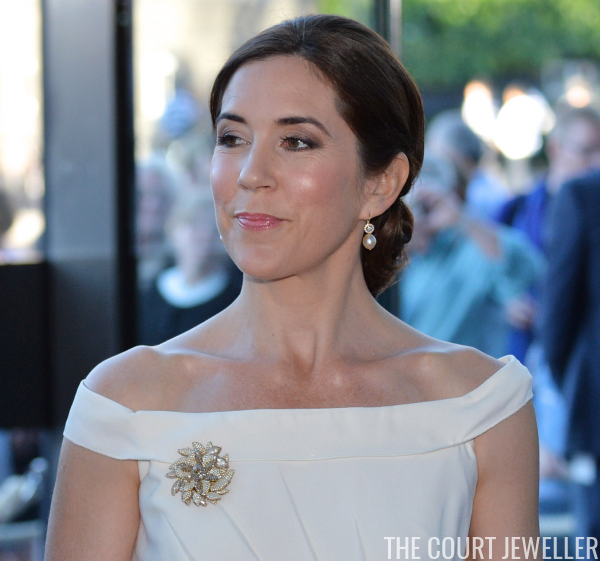 Dulong Champagne Pearl Earrings: Mary wore these lovely diamond and champagne pearl earrings from Dulong at the christening of Prince Oscar of Sweden in May 2016. 24. 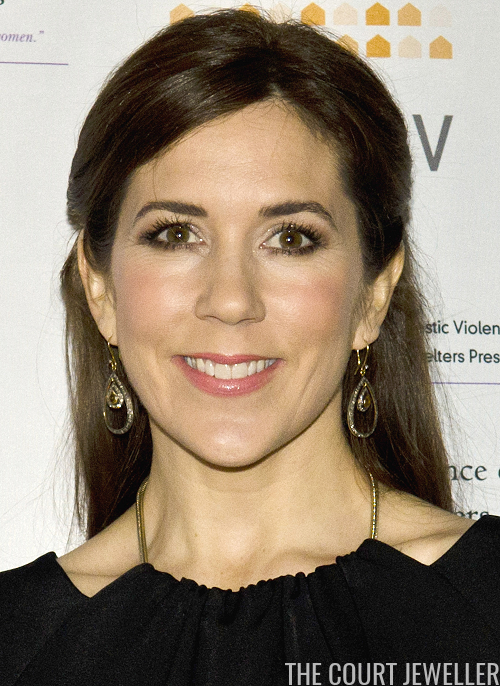 Double Diamond Hoop Earrings: These glittering earrings, featuring nesting pear-shaped diamond hoops, were worn by Mary at the 2nd World Conference of Women's Shelters in February 2012. 23. 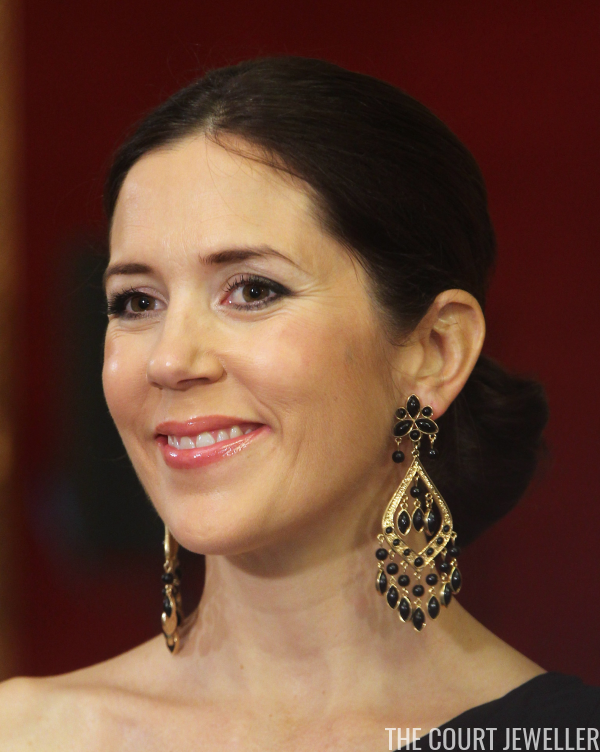 Lynggaard Dark Chandelier Earrings: Mary has worn this modern pair of chandelier earrings in dark hues from Ole Lynggaard Copenhagen at various events, including a Danish Ambassadors dinner in Sydney in November 2011. 22. Large Round Leaf Brooch: For the inaguguration of the house of foreign industry in June 2013, Mary wore this large round abstract leaf brooch. 21. Amrita Singh Statement Earrings: Mary wore these shoulder-grazing earrings from Amrita Singh for a reception at Schloss Schwerin in September 2010. 20. 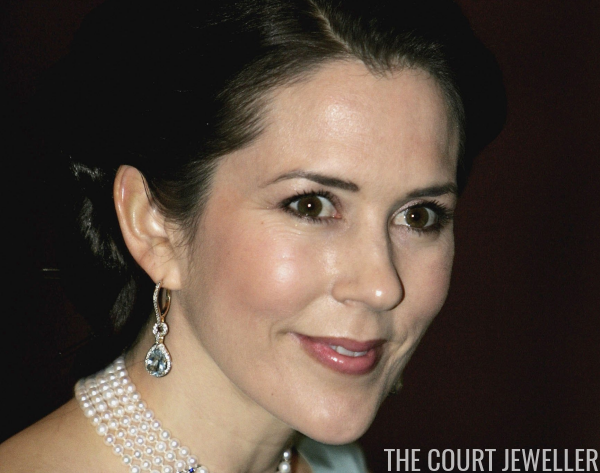 Black and White Pearl Necklace: This double-stranded black and white pearl necklace, which Mary wore at her engagement gala dinner, was reportedly an engagement present from her father-in-law, Prince Henrik. 19. 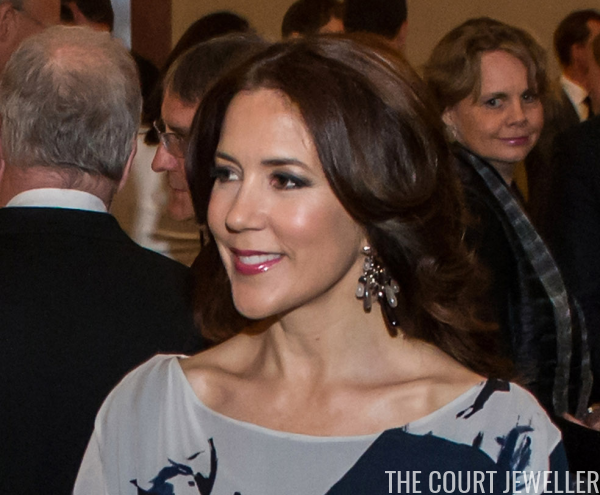 Aquamarine Drop Earrings: These diamond and aquamarine earrings, worn above at a 60th birthday gala for King Carl XVI Gustaf of Sweden, are thought to have been an engagement present from Mary's husband, Crown Prince Frederik. More of Mary's best jewels will pop up here tomorrow afternoon!